You may not be able to have Ruby Rose for yourself (I doubt her fiance Pheobe Dahl would like that), but you can be her. At least for Halloween. But in order to really pull off your Ruby Rose Halloween costume, you'll need more than her Orange is the New Black jumpsuit or her chopped, dark hair. You'll need to get her tattoos right. And there are a lot of them. Rose, who identifies as gender fluid, has dozens of tattoos ranging from flowing script to a Teenage Mutant Ninja Turtle cartoon character to a traditional-style tiger. They're so recognizable that simply covering yourself in fake tattoos won't do. I mean, you wouldn't dress as the Mona Lisa and wear a blonde wig. And her aesthetic, which walks the line between traditionally masculine and traditionally feminine, is absolutely a work of art that deserves respect. Luckily, others have gone before you and provided a whole slew of resources to help you nail her inked-up exterior. They can be reproduced by making your own temporary tattoos with a printer and temporary tattoo paper. There are also a few pre-made temporary tattoos that come close enough to pass. I've thrown in a few tutorials on her look, too, for good measure. If you're going to do it, do it right. If you have access to a color printer, you're golden. The Sorry Girls have taken all the hard work out of making your own tattoos with their tutorial on how to print out Ruby Rose's tattoos on temporary tattoo paper. They've also assembled a print-out of her most famous and visible pieces of ink. If you can't find temporary tattoo paper at your local office supply store, you can purchase it online for relatively cheap. The paper creates a tattoo you can apply using only water. For the tattoos across her knuckles, use a waterproof liquid eyeliner pen. Rose has the words "just" and "love" written across her knuckles, which should be pretty easy to recreate. If you don't have a printer, you can still use temporary tattoo paper and the right markers to get the Ruby Rose look. This costume tattoo kit has everything you need. You can also use the skin-safe markers directly on your body. See up-close examples of her tattoos here. You can also just buy a bunch of temporary tattoos a-la-carte and recreate the look as best as you can. Here are some ideas to get you started. This one will serve as the pink diamond inside of her right forearm. She also rocks a Leonardo on her right arm. Her right inner bicep has a yellowish orange tiger. This is kind of similar to the heart on her left inner arm. Rose has a realistic dog on her right hand, but those are kind of hard to come by. You can squeak by with this wolf in a pinch. You can use this woman's face in place of the woman's face on her left inner bicep. Behind and above her dog tattoo looks like blue bubbles or a blue circle design. This tutorial shows you how to get a more androgynous edge to your makeup look. And this one will show you how to fake Rose's short hairstyle. Put all of these elements together and you'll be set to go. 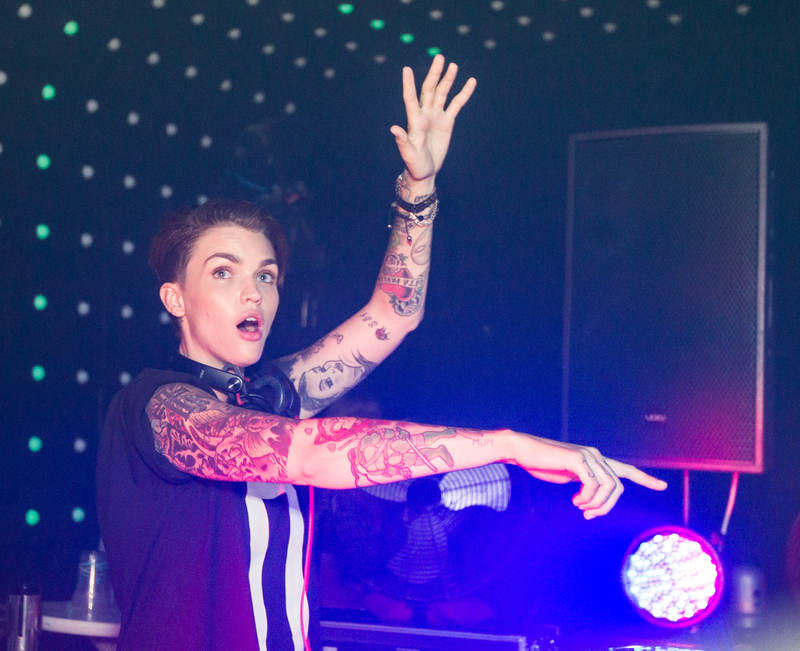 You might want to consider a body guard, though, because wherever Ruby Rose goes, crowds follow. Want more temporary tattoos? Check out the video below, and be sure to subscribe to Bustle’s YouTube page for more hacks and tricks!